Today, is probably the last time we have an 85 in the forecast for quite some time. I wrestled with those evil skeeters one more time this morning. I was able to paint the right half of the deck, with the cooler weather coming, doing the other side will be a much more pleasant experience. It's hotter than hell around here. The average daytime high is supposed to be around 89°-90°, but it's in the mid 90's. Getting highly sick of it. Finally a break in the miserable heat we've been suffering down here the past few days!!!! The temps are down a bit from the mid 90's to (according to the weather people) 91° currently, which is not what anyone would call "cool", but the humidity is down to 43% and there's a nice breeze blowing, which makes a huge difference. Given that combination, and with a little imagination, it actually feels a little bit like fall today. I'm hoping that by next week, we start dipping into the 80's for daytime highs and the low humidity and breezy conditions continue as well. That would make me a happy camper!!! It's still pretty warm down here, but you can sense it's slowly starting to change a little. The predicted low for this morning is 33 degrees. That usually happens about sunrise. I'm amazed how well the TV set alone heats this room. I did start the furnace just to test it. Still in the lower to mid 90's down here for the daytime highs with the heat index over 100°!!!! As the local weatherman said the other day... "uncle already!!!". Supposed to dip down to a chilly 90° by mid-week. Check out this crazy flower growing right next to the garage door. I didn't have the heart to kill it, nature will take care of that soon enough. Too bad because of where they're growing you can't transplant them into a pot. Maybe clip the blooms, strip some of the leaves off of the bottom half of the stems, then put them in a vase of water? What? No ID of the species? I'm going to try to find out, Mama said she planted something like this years ago. You know our anniversary is 10/1. I always forget... 14 years now, I think. If you could take a more close up picture of the blooms and the leaves, we might be able to to figure out what it is. If worse comes to worse, I could email the pictures to our local University of Florida Agricultural Extension where they have one of the best plant experts anywhere. They'll gladly tell me what it is. Looks kinda like Portulaca. A little research points to Portulaca Grandiflora Sundial. I think that's it! Thanks, Thor. Nothing like the chance of some severe weather to get me motivated. I need to winterize the boat. There are 2 drains on the engine block, 2 more on the exhaust manifolds. There's also 4 hoses on the front of the engine that I disconnect and drain. I'll run the shop vac on the floor if I feel up to it. I put a tarp on it within the next week or so. Since I've already got the ladder out, and this needs to be done before I put the boat in it's resting place, I'll clean that gutter on that side of the garage. Still hot and dry down here. Supposed to dip down to a chilly 90° today, from the slightly more toasty 93° and up that it has been. Very warm for this time of the year, 65 degrees. WET!! ^ They were calling it a Cat 4 storm this morning. 375,000 evacuated. Good luck to those people. It's still warm here but raining. I'm having trouble keeping the house cool, the nasty crap in the air is making my sinuses ache. I need to drain the irrigation pump and clean the chimney flue tomorrow. I'll restart the pilot light in the fireplace in our bedroom. Like the TV in the living room, the pilot lite is enough to warm the room a little bit. Heard reports that they might get hit with 175 mph winds. Could be the strongest storm to hit the US in history. I am so thankful it didn't hook to the right and come across this way. This could turn out bad for a lot of people. I'm praying for those in the Panhandle and Georgia. Mexico Beach is gone. Everything destroyed or even leveled. The videos coming in are shocking to say the least. 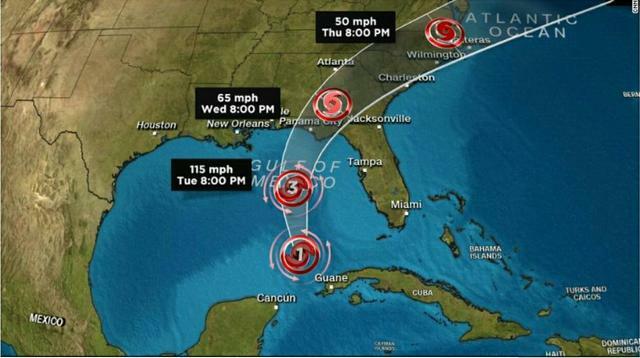 Catastrophic damage at Panama City Beach, Calloway, Panama City itself, Lynn Haven, etc. - it will take MONTHS for the rebuilding to start. There has been 1 confirmed death, and I'm sure there will be a lot more. Both hospitals in Panama City had their windows blown out, roofs halfway blown off...you name it. Local TV stations (7 and 13) off the air in Panama City too.